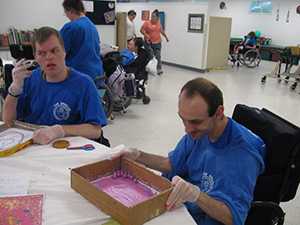 The Angelus is home for severely handicapped persons who are not able to care for themselves. All of the residents and students have cerebral palsy and all use wheelchairs. The Angelus is a place to live, to love and to learn. The Angelus was founded in 1979 in St. Petersburg, Florida. Within a few short months, The Angelus became “home” for eight children ranging in age from 2 to 12 years. The home was supported by State Funding, but the founders continued to work at night to supplement the income. The Angelus then became a non-profit organization so they could begin to accept charitable gifts. The community responded with financial as well as volunteer help. By 1985, The Angelus had 14 children entrusted to their care and the home in St. Petersburg was bursting at the seams. A search for land was begun. The dream of a farm-like environment, with small animals and gardens for the children to care for and sidewalks for the wheelchairs, became a reality. Seventeen acres of beautiful wooded land was obtained in Pasco County. The first Angelus Country home was completed in 1986 and four older children moved up to Pasco County. Six additional residents completed the home. The home in St. Petersburg (with 10 children) was still in operation, but the “family” was split. Interested people in Pasco County came to the rescue. A committee was formed and local contractors donated materials and labor. Within 4 months, a second home was built and furnished. In August of 1987, the 10 children in St. Petersburg were moved to Angelus Country and the family was reunited. In 1992, the third house was obtained and 5 gentlemen have made it home. This house also has an extra room to provide “respite” care for handicapped adults from the community whose families need a much deserved rest. A fourth home was opened in February of 1998. This home is for residents who have special problems and need extensive care. There are 3 residents there presently. Nine years passed, since The Angelus was founded and the children had grown to adults. The need for a day program became evident. With a donated portable classroom, The Angelus Day Program opened in 1988. Several adults in the community began attending daily classes from 9 to 3 each day along with The Angelus adults. These folks are also in wheelchairs, living at home with their aging parents, traveling daily from surrounding communities. In one short year, the portable classroom became too crowded and once again, the Board of Directors formed a construction committee. In July of 1990, the new 50 x 100 feet building was completed with the help of volunteer community labor. Now, 26 adults attend the Day Program, learning computer skills, home economics, small animal care, gardening, arts and crafts, physical education, and academics. An additional woodworking shop has been built and it is a source of enjoyment to our students. Many of the articles are sold at our picnic each year. The country music artist Charlie Daniels was introduced to The Angelus in 1990. Charlie came to Florida and encouraged many of his friends to join him in concert to provide funds and awareness for The Angelus. 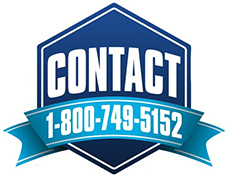 He has come every year and the event grew to include all of the Tampa Bay Area with the concert held locally and a Golf Tournament held at various major golf courses. 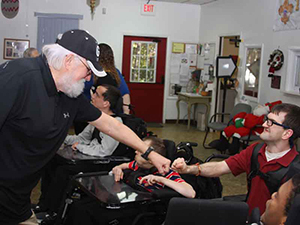 Not only has Charlie Daniels lent his name and talents to The Angelus, he and his wife Hazel have become good friends to all the residents. The Angelus has 5 group homes with 32 residents. The waiting list for residential care is becoming larger as parents who have taken care of their youngsters all these years are becoming too old to do the daily lifting and continued care. The only alternative for these people is nursing home placement or supported living. The residents of the Angelus are not sick and do not need nursing home placement and supported living is not a practical solution. They need a secure “place to live, to love, to learn” and that is what The Angelus provides. With your continued help and support, the goals and philosophy of The Angelus will be maintained and the quality of life for the people who cannot help themselves will be assured.